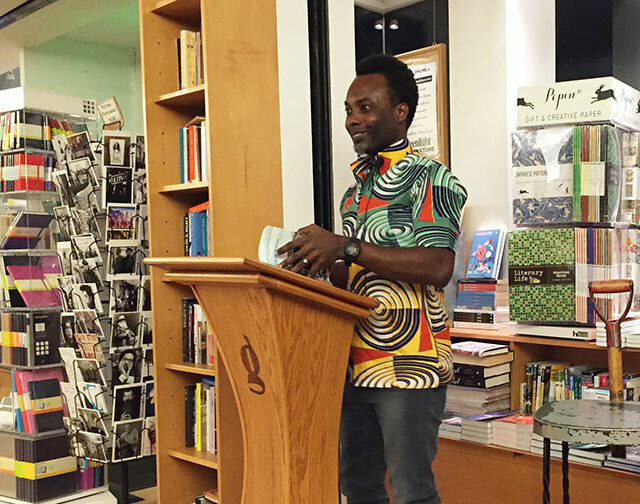 Identity is central component of A. Igoni Barrett’s novel Blackass, the story of a Nigerian man who wakes to find himself transformed into a white man. 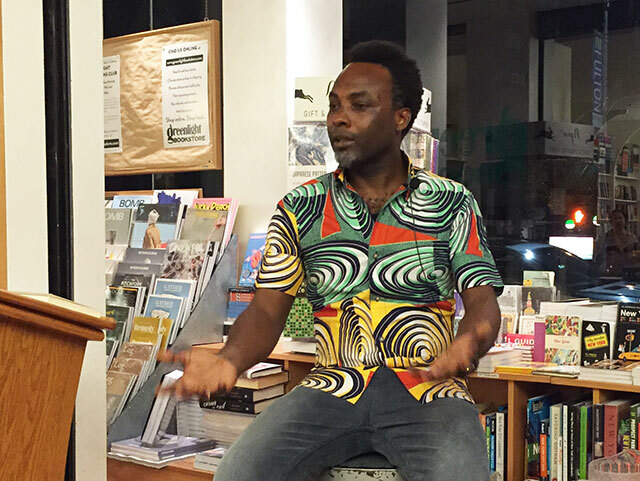 Barret read from the novel and discussed it with Chinelo Okparanta last week at Greenlight Bookstore. Barrett’s grandmother wanted him to become a doctor. Even though he had always felt interested in the arts, he wanted to fulfill his grandmother’s dream and entered into the sciences in school. He did well. Then he had to start cutting up bodies. Despite seven years of schooling headed toward medicine, he decided he wanted to get himself as far away as possible from blood. He spent the next ten years learning how to write instead, he says. Writers have a hard time in Nigeria, Barrett explains. Nigerians often don’t read literary novels, he says and often their reading material of choice is the Bible or the Qur’an. When he worked at a publishing house, he could expect to sell twenty-thousand copies of a book in the United Kingdom, a nation half the size of Nigeria. But in Nigeria, publishers struggle to find enough buyers to justify the cost of a book’s printing. Nigerians don’t usually turn to books for entertainment, Barrett says, in part because of the long hours they spend working, but also because the culture of reading doesn’t necessarily exist. When he was growing up, he didn’t have access to books and without the foundation and cultural experience of reading, it is hard to learn that experience. “Reading is a language,” he declares. People often end up reading online materials now rather than books. Many people don’t know what novels even are. Getting access to cellphones is often easier than access to books, so often people end up playing Candy Crush instead of reading. “People don’t quite understand they can enjoy reading a book,” he says. There is a small group of people–mostly people who themselves want to be writers–who read books. However, Barrett finds that people are rarely reading books simply for the sake of reading. The result is publishing books in Nigeria is not very profitable. Another challenge for authors and publishers in Nigeria is piracy. If a book becomes too popular, pirates will buy one copy, send it China, and print a whole run very cheaply. In some cases, they will even go as far as bullying booksellers into only buying the illegitimate copy of a book depriving the publisher and author any portion of the proceeds. Barrett always had an interest in reading though. “I was always hidden away in my room reading books.” He started with procedurals like novels from James Patterson. But when he was sixteen, he read Franz Kafka. He says this writing is what made him excited. He wanted to do something different and wanted to enter into the conversation. He adds that Kafka was a good way to enter into the novel he was writing, and then as the novel evolved, it turned into something entirely different. “I didn’t know what the book was about when I started writing,” he says. He also didn’t expect that the novel would be published. Once he realized the novel was about identity, he began playing with that idea and pushing the boundaries. Nigerians often say there are no racial issues in the country, Barrett says, and he wanted to confront that idea. It is a valid statement to say that writing is for other people. It is always important to juggle those ideals. In Nigeria, the official language is English, yet the nation still has not claimed that language. There is Nigerian version of English analogous to American English. The country still relies on the Oxford Dictionary from the United Kingdom and has no record of local variations of spellings or local words adopted into English from local native languages. Blackass includes Nigerian-English words. However, without a standard dictionary, there is not a standard spelling. Even the Nigerian Guardian, the local newspaper, didn’t have a style guide. Adding to this confusion, native Nigerian languages do not have an agreed upon script. “I hope one day to have a dictionary,” Barrett says.